Every film in the Jurassic Park / World franchise has plenty of problems, but it is actually quite simple to work out which is the best of the four films to date. Do you know what I want to see in a dinosaur film like Jurassic Park? Dinosaurs. Do you know what I don’t want to see in a dinosaur film? Annoying children. So, which of the films has the the most amount of dinosaur footage (absolute, and especially relative to run time) and the least amount of annoying children? Yes, Jurassic Park III is in fact quite clearly the best film to date. Simple. Case closed. For the first time I’m breaking away from the previous annual awards and I’m writing something that is more of a general roundup of the year. I already had found I needed to heavily alter my previous series of awards last year with my changing interests and responsibilities and finding that I’d need to make even more drastic edits this year I though it time to finally shelve the awards and move to a more general summary of the year. As with last year my blogging has been even more sparse. In part this is down t having less and less time available and also the fact that I have now written close to 2000 pieces between the Musings, the very old (and now apparently no longer online) Dinosaur index on Bristol University’s system, my Guardian blog and various other outlets. That’s on top of the 1000+ questions I’ve answered on Ask A Biologist as well and it all means that I’m somewhat worn down by blogs. Not that I don’t have a desire to continue, but it’s hard not to rehash existing issues and the most popular areas (bird origins, new species) are very well covered and I struggle to bring anything new or find the enthusiasm a lot of the time. Still, things are continuing. People might have noticed that the Guardian blog in particular has been in hibernation for around 6 months now. It was originally my intention to quit as while I liked it, there were ever increasing pressures to cover the very areas I had least interest in but a solution was stumbled upon – to draw in additional bloggers and expand this from just dinosaurs to all palaeontology. As such there was a call out for people to apply and the editors are close to making a decision on who will be asked to join me and the whole thing should restart in the new year – stay tuned. My own new year for 2015 saw me taking a trip to LA for a long overdue break, to see the LACM and its collections, visit La Brea and its tar pits and in particular catch up with Mike Habib and try to finish off some papers. Our work on a new and exceptional Rhamphorhynchus held in Canada is now out, as is out collaboration with artist Matt van Rooijen on wingtip curvature and what that means both ecologically and perhaps systematically for pterosaurs. Sadly for me this summer lacked any meaningful trips – I’ve been out of the field far too long, and I desperately need to get back to China to finish several projects, but the late summer saw a flurry of activity. First off, rising artist Rebecca Gelernter joined me in London for several months to work on a series of projects as part of her scientific illustration degree. Some of her work (both life reconstructions and skeletal work) will be appearing very shortly in a number of papers for me and John Hutchinson has also put her nose to the grindstone for some illustrations too. If you’ve not seen her stuff before, do take a look at her website and she recently joined Twitter too. Next was an obvious highlight of back to back conferences: Flugsaurier in Portsmouth and SVPCA in Southampton. The former was the latest in the running series of pterosaurs conferences and saw a superb collection of talks as well as the obvious benefit of getting together people from all over the world to talk pterosaurs. Seeing colleagues and experts you may only otherwise rarely or never see makes it an extremely valuable gathering, even if there were no talks and posters. Still, much was exchanged and much got done and a great time was had by most who survived the weather. As is also becoming a pattern, a volume of papers will also be published from this meeting, and well follow the link if you want more. SVPCA was a bit more cosmopolitan than usual as several pterosaur delegates stayed on for the second meeting (as had been hoped, each meeting encouraged some people to the other when they would not normally attend) but was also an excellent meeting and gathering of vertebrate palaeontologists. There were some format changes (with more to come) but none the worse for it, and for me it is probably the best annual meeting out there and I love it. Long may it continue, though sadly I look set to miss the 2016 meeting owing to being in Canada. 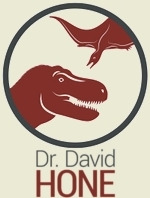 One other thing that needs a mention for 2015 is the Daspletosaurus paper. This started as a crowdfunded platform that took me to Alberta to work on a very chewed-up skull with Darren Tanke. It took a while but the paper was eventually completed and published and I’m very pleased with the final, detailed study. A lot of people contributed their time as well as cold, hard cash and I’m extremely grateful for all the help that allowed me to complete this research. Looking ahead, I’m working on what are hopefully the final edits on the Tyrannosaur Chronicles that will be my first book, and there’s a paper on sexual selection in dinosaurs now in press that should be out in the next few weeks. There’s a couple of other works in submission and I’m contributing to the Flugsaurier volume too, so fingers crossed that I’ll have a couple more pieces out next year. That pretty much wraps it up for now. This blog will continue sporadically I’m sure so keep an eye out for new posts.